In our travel last summer to Michigan and Indiana, we stopped by Cayo Service & Repair which is located in Watervliet, MI where current owner, Chuck Cayo continues to work his magic restoring, repairing and promoting vintage Avion Luxury Travel Coaches. They do not have a website, but they do have a facebook page with limited info including their contact info and map for directions. My goal in this post is to share some storage ideas we have come across that owners of Avion’s have employed to garner some much needed additional storage space. Please remember- there is a cautionary tale about adding excess weight to the rear of any travel trailer. It can throw off your correct weight distribution and tongue weight ratios and therefore safety-so please use caution and get professional advise as needed. Anyone who currently owns an Avion, regardless of year (except perhaps those five 5th Wheel Avions that were produced and may be still in service) you know that Avions’ suffer from a real lack of exterior storage for important things like modern sewer hoses, fresh water hoses, repair kits, emergency roadside warning kits for breakdowns, not to mention the proverbial citronella candles, exterior carpet mats, camp chairs, gas grill, etc. Our ’73 Avion LaGrande, 28 foot streetside storage and compartments for water heater, sewer/water hook up and one small lower compartment. But it is a direct inlet to under my bed! With regards to this curbside “storage area” in the two photos directly above—- it should be mentioned these are underneath my curbside bunk used for sleeping. So really..no sewer hose is going in there!! 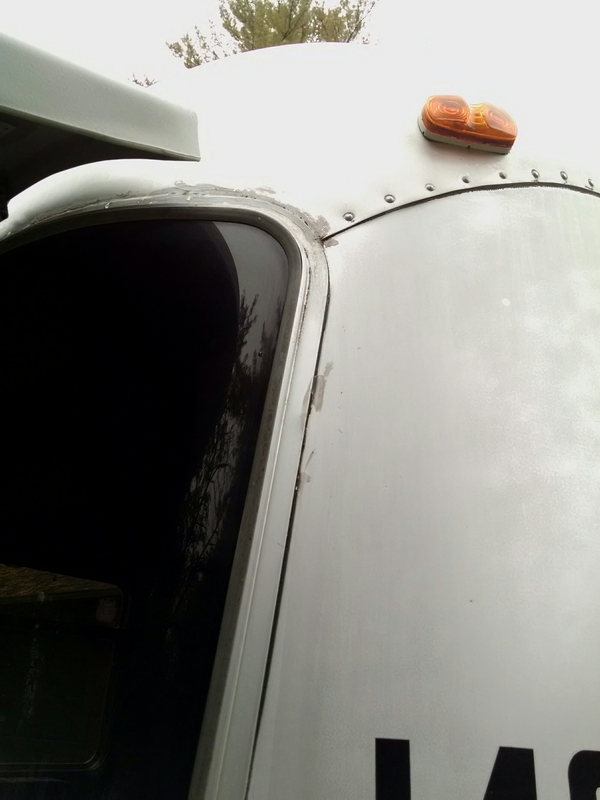 We also found when we bought our trailer (we are fourth owners) that this area had been leaking due to poorly maintained rubber gasket around the door flap. Kevin has since replaced and realigned and it no longer leaks. We do manage to cram our Anderson leveler system into the small curbside drop down compartment (see sample in photo below) as well as some chocks for wheels and the plastic pads for our crank down levelers. See previous blog post for details on this project from Summer 2017. Some Avion owners have taken to install water run off shields over top of these curbside access panels. This is a great after market idea and one we are going to still look into for double protection from the rain that literally flows like a river down the side of the rig. Here are two photos from the same rig that we saw on an older Avion parked at Cayo for repairs. The smaller, lower one is where we store our leveler system, etc. It should be noted that NONE of these small drop down exterior storage areas are waterproof by any means. The aluminum panel underbellies of these Avions are great, but after e.g. 45 years of being on the road (our rig has been to Alaska at least 2 xs and Florida annually for over a decade or more) they are not water tight- not sure if they were ever truly meant to be. 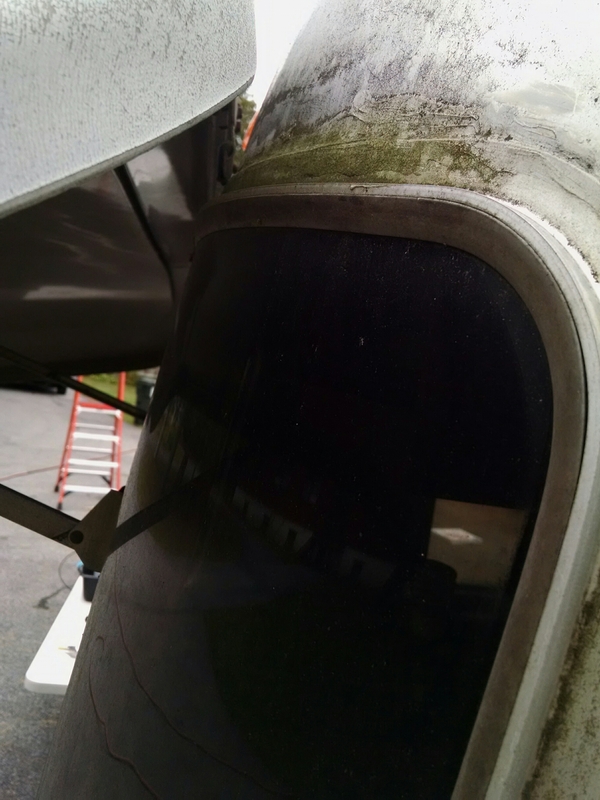 So whatever you plan to put in these smaller areas that are on the sloped down lower part of your Avion…be sure it is nothing that will rot, mold or get otherwise ruined by splash from your wet tires, or rain seeping in would wreck. Also, replacing the original latches with new stainless steel latches is also advisable. The originals do rust and can stain your exterior finish with their run off, or rot off completely at some point. Source for the stainless ones is Cayo themselves, or here is a link to the exact latches themselves at VintageTrailerSupply.com. BTW- VintageTrailerSupply.com is a great source for tons of stuff and their customer service is outstanding- I know this from personal experience. Some have reported getting them at your local big box hardware store, but I am not sure if those are 100% stainless–I suspect not. Here is another photo we took at Cayo last summer. You can see where some ingenious owner fabricated a rear bumper storage area similar to what is found on many Airstreams. This one had two liftable storage lids that lifted up from the top. The hinge end was near the spare tire mounted in the center. Note--the spare tire mounts (and tire covers-we have that too!) were OPTIONAL gear when these trailers were made, at least in the 70’s and so the original owners would have had to have them ordered as part of their options package at the time. Some used ones can still be found by scouring the facebook pages where Avion parts are being sold by folks who are salvaging the ones unable to be fully restored but are still good for parts. There are several, just do a simple search on Facebook for Avion Trailer Parts. You may have to ask to be invited as some may be closed groups to keep out spammers and ner-do-wells that could clog up the process of Avion owners reaching real Avion owners. This one had its sewer hose neatly tucked in. The tray underneath can be made to go completely underneath the whole area. Its just that due to the spare tire placement your access can only be from one side or another. I do not recall if these lift lids were fastened down with latch locks or simple 90 degree angle hasp locks with pad lock but simple enough to do! Again, this tray sits exactly between the round bumper and the trailer body. Originally, we had a plan of attaching brackets to hold vintage aluminum camp coolers to the back of our rig. (That is until we went to Cayo and Kevin saw the rig in photo above) The idea being when on the road, they could hold our water hose on one side and our sewer hose (in a plastic trash bag) in the other. They would each sit on top of the bumper area and on either side of the spare tire. Reminder, if you go this route, be sure to select one cooler small enough to fit underneath your original license plate holder and light bracket because I really think you want to keep that original feature intact. I really like this idea and am still trying to convince my husband that my Ebay purchase of these two coolers was not in vain. He is leaning more towards the inline tray concept instead. Let’s see who wins this one! Maybe Cayo can fabricate something inline that has the access doors opening on either end and thereby satisfying both parties!! This is the larger of the two that I bought on Ebay. Sadly, during shipping it got the dent on the top. Does not affect use, but did break my heart a bit. Note the bottle opener built into the handle. This cooler would be on the curbside rear making it very handy to you when under the awning enjoying a cold beer…or…whatever! DUEL PURPOSE!! With the vintage aluminum cooler concept (they are highly collectible so plan to pay a bit for decent shape ones) I like the idea that after you park and take out your hoses, these coolers can actually still perform a viable purpose. I don’t know about you, but I hate my 8 cubic foot refrig being taken up with bottles of beer (or a growler is the worst!) and any other soda cans or large pitchers of green tea, juice, etc. that could find a far more suitable home and keep deliciously cold in our vintage coolers on the “poop deck”. Heck, one of our coolers even has its original bottle opener right on the side. How convenient is that!!?? Here is a photo of both of them on the back. They are not installed at this point in time. Kevin’s plan was to drill through the bottom of each one, using a rubber gasket to block leakage (but who cares if water drips out right?) so that when we have our gear in there, a simple hasp lock with padlock could be used to prevent (or deter) access to inside and ability to undo any straps, etc. and steal the cooler. We also do have the original hard plastic spare tire cover but it does not fit when we have the coolers in place as well. Its do-able but the coolers would have to go a bit further to the outside edge more as the hard plastic cover is wider by at least 3 inches overall to the vinyl cover we have on there now. While at the Silver Avion Fellowship Rally, summer 2017 in Elkhart, IN we also saw this Avion. The owners had actually had an additional mounting bracket installed beyond the rear bumper so that they could hold this lockable, hard plastic after market storage container. We have seen these on cars, but honestly we wonder about the added weight that this box and then its contents includes. There are many stories about not putting too much weight on the rear of Avions (or any trailers for that matter) that will skew the delicate balance between your weight distribution, tongue weight, etc. So please be careful about any added weight (vintage cooler, generator, etc. of any weight) that you put on your rear end. Here is another example we have seen that utilizes that area between your bumper and your rig itself. This was on a 60’s Avion Sportsman model that we were fortunate enough to meet the owner and take a tour inside when at the Northeastern Tin Can Tourist Rally at Sampson State Park in the NY Finger Lakes, September 2017. There were FIVE Avion’s at this awesome rally!!! He simply used bungy cords to secure the hose while traveling o the road. This is a basic fix but for a sewer hose and some other weather proof types of supplies (waterhose in a vinyl bag? )—it works….and is completely ventilated! Somewhere along the way, a former owner of our rig applied rubber cup covers with adjustable and removable stainless steel bands on both ends of our tubular rear bumper. Yes the bumpers are hollow! So my husband, Kevin decided this would also be a great place to store a longer, spare electrical cord for our trailer besides the one that is permanently attached to the rig in the streetside compartment. Its a little tricky snaking the cord in and getting it out but thank goodness he did! We had to use it when at the Tin Can Tourist Rally we attended last summer. Due to some uneven ground and where we had to park in order to extend our awning we were too far a distance for our onboard cord to reach. Wholla….out from our rear bumper appeared the extension with a double ended link to reach the electric post! Well that is all I have for now, but I will continue to provide updated photos as we are on the road and see creative ways to increase your Avion’s exterior storage. Safe travels, and remember….ONE LIFE! LIVE IT!!! It’s November 1st and last weekend we Sadly had to put the Pewter Palace into winter storage. Living in upstate New York, at the entry region to the Adirondack Mountains, we can easily get snow in November and we average about 9-10 total feet of snowfall annually. This fall was exceptionally warm and that allowed us to extend out camping season into third week of October with Temps so nice we only out the heat on a few mornings for a half hour. Then the rest of the days were in mid to high 70’s which was awesome. Several evenings we sat at our campfire with Pj’s, bathrobe and slippers. Nice!! Now that we have sold our house and downsized into a townhouse apartment we needed a place to store the trailer year round. Our apartment complex does not have any common parking or storage lot like some do. We had toyed with renting a garage to keep the Palace in from the start. Knowing many Avion and vintage trailer promote inside storage for best preservation we knew that was the route to go if we could. Last year she was inside but our former storage place got locked up for winter and we had no access. We didn’t like that because sometimes we have small projects we could be working on over winters. Needing space for some of our belongings that we knew could not fit into apartment (yes still more downsizing to go for sure) it seemed like a no Brainer to get a storage garage to handle all our needs. We found a great place one exit south of us at exit 18 which caters to RV and boat owners. It’s brand new, clean and we have electric outlets. The garage is 43’long x14′ wide x super tall over 20′. Big huge class A RVs have no problems getting in. Kevin got the Pewter Palace backed in perfectly on first try. Tires up on rubber pads to breath and off concrete, water lines all blown out and RV antifreeze down the sinks, tub and toilet and we are all set. Till early spring! We will be itching on get her out and will shoot for March or April at the latest to get in a nice long second camping season. May 28, 2017-Queensbury, NY: Our redecoration of the interior of the Pewter Palace is almost finished. Today we tackled the finishing touches of our dining area. This final step included a repainting of a very rusted ceiling fixture and installation of the curtains and lace valances. The cut glass crystal cover is original too and cleaned up well and sparkles with the new LED bulb we exchanged. We refitted all of our fixtures with LED bulbs from M4LED.com which offers great products and customer service. Here is our lovely, cozy dining area in our Pewter Palace. We repurposed one of our custom made wood reenacting tables made by Fort Augustus Woodworks which collapses down and folds away when this dinette needs to be used as a bed for guests. We just love it. I am awaiting delivery of the small clock face that goes underneath the vintage Black Forrest Deer Head mount (what legitimate “Gasthaus” would be without one right?!). It was found at a local antique shop and is actually hard plastic so its lightweight and we could really secure it to the wall with no problems at all. When we take our big trip to MI and IN this summer- one of our stops is Frankenmuth, MI which is a Bavarian town. 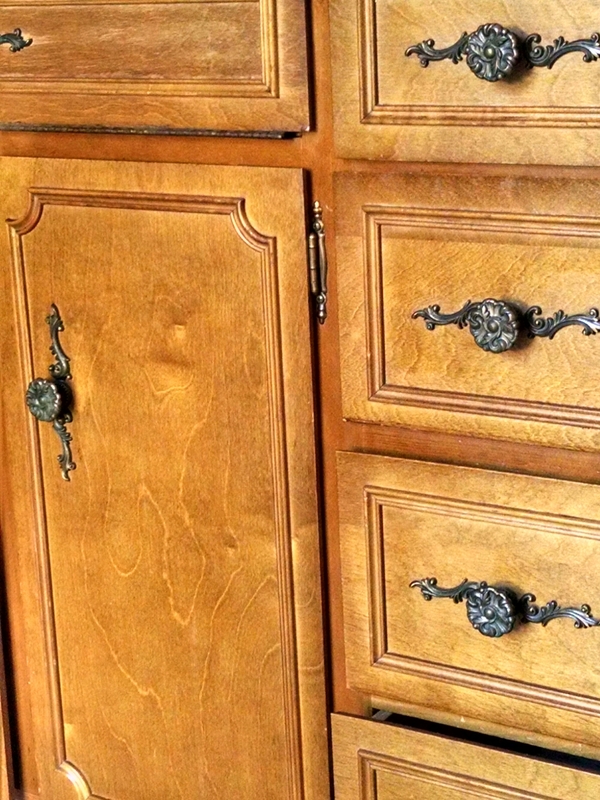 I hope to find a quartz table top style cuckoo clock for the trailer….THAT will be the crowing glory! For now, the small antler clock on the table works. The little red car and trailer on the table are Salt & Pepper Shakers from Vintage Trailer Supply— are they adorable or what!? The fab vintage look lamp was a find at the Goodwill Store on Shelburne Rd. in VT (I always try to make a stop when coming or going to visit our daughter Sarah and her family)–for $4 what a find! 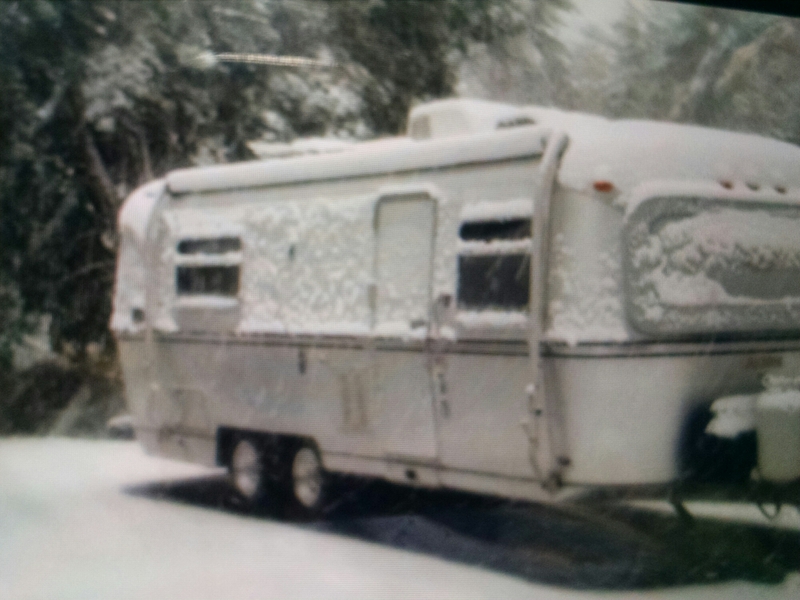 As we were preparing for putting our trailer in storage we experiences the first snow of winter in Early October! Sure wish we lived in a climate that would allow for full time use of our Pewter Palace. I so would like to simplify living and start spending more time living a more minimal and simple life and less time trying to maintain our very large house which is daunting at times. 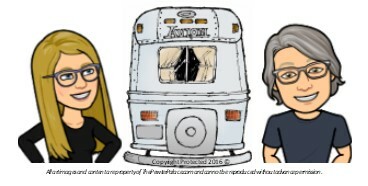 We love watching the many full timer blogs we subscribe to that have couples living the RV life. Some work full time, other part time and still others have managed to make ends meet enough to keep happily on the road. I envy them. Snow pictures….here is a video kevin took during the first snow…with our beautiful Pewter Palace…. Oct. 15, 2015. 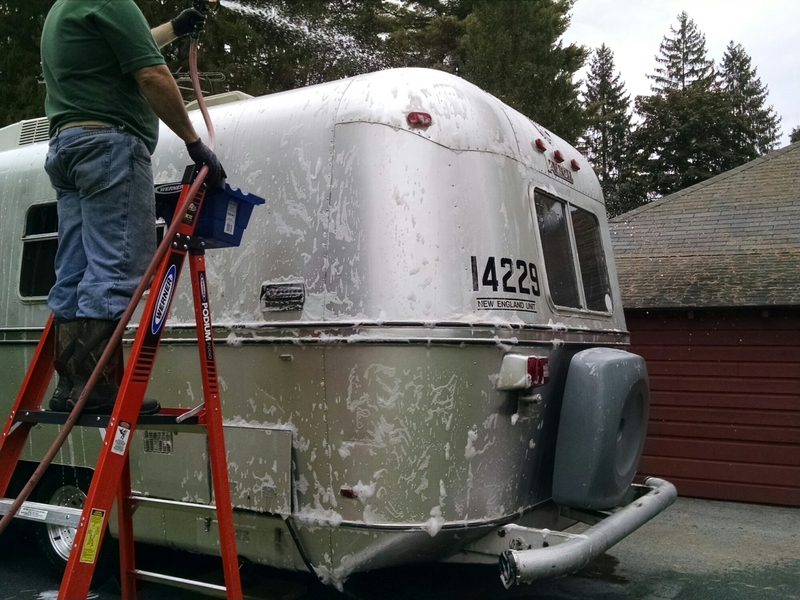 We decided before prepping her for winter storage the Pewter Palace would get her first bath by us. Scouring the various online forums and FB Avion lovers sites (I now belong to two private FB groups and one yahoo group) we decided to proceed with the recommendation to use Simple Green Pro HD cleaner. It’s the PURPLE stuff. Then you dilute it per instructions. It did a very good job! Getting up high enough to wash and check the roof is not easy. It is suggested when you work on the roof of an Avion (or similarly an Airstream) that you use a sheet to plywood to kneel on so you can diffuse your weight and leave no footprints. I am actually going to purchase a very nice scaffold set up from HD for a Xmas gift for Kevin…ha, ha. It will enable him to be high enough that with his nice ladder with platform he will be able to reach and get to nearly everything on the roof. But…that is not till next spring now. Here Kev is washing and when she is wet she is gorgeous! We plan to get her polished and waxed in spring. Avion’s are not a mirror finish like Airstreams (which is nice) but the anodized aluminum is much stronger, durable and when given that “wet look”coating she is fabulous! 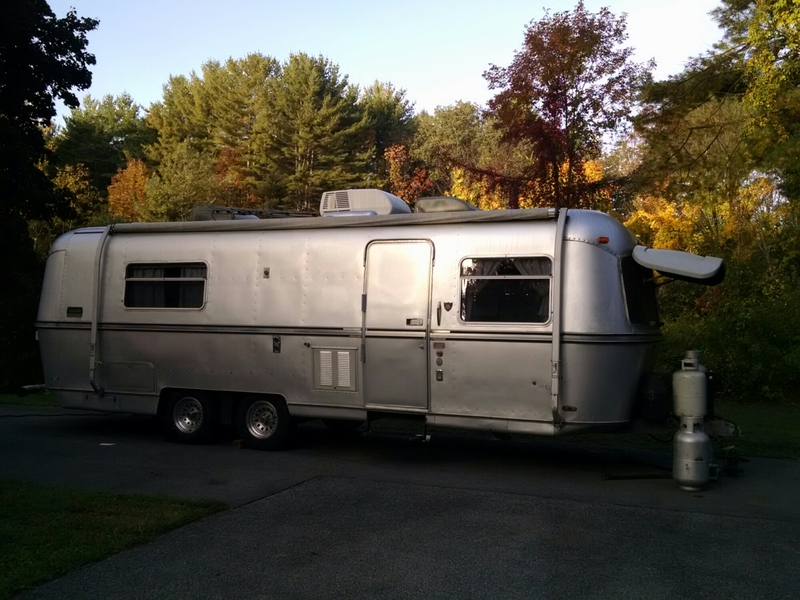 Welcome to my blog about our journey of purchasing a vintage 1973 Avion all aluminum coach travel trailer in September 2016. We had been shopping around for about 7 months for the coach we wanted to call our own. On one trip to see a pretty sad, run down 73 Travelcade model we came up with what our name for the one we hoped to eventually purchase would be. 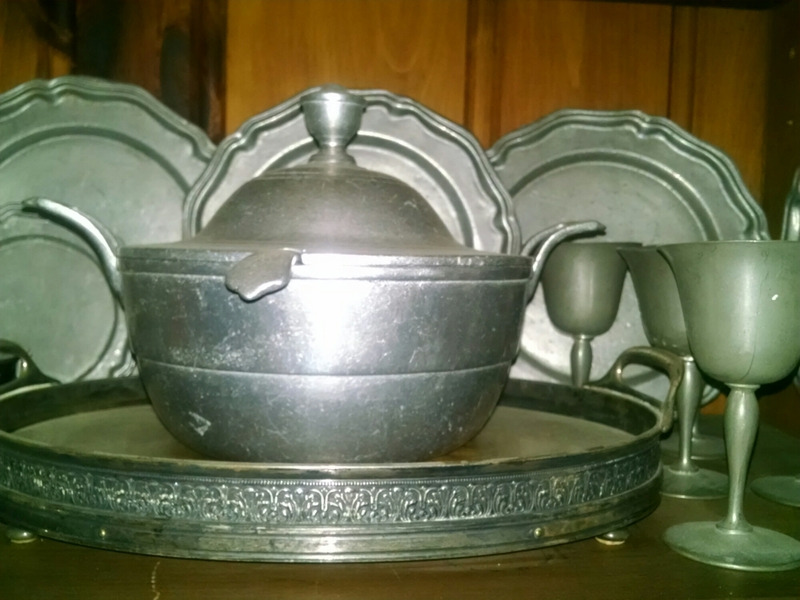 For those who do not know me I have a passion for 18th Century American history and in this have been collecting reproduction (all I can afford) pewter dishware and serving pieces for over 20 years. Admittedly I have way too much but when I operated a B & B in a period farmhouse in CT in the early 2000’s it came in handy and did catered dinners and colonial cooking demonstrations for 10-15 people. Anyway, the sheen and color of the anodized aluminum of the Avions reminded my husband Kevin and I of my pewter…and well calling a living space that is less than 30 feet long a “palace” is just tongue and cheek fun! So we had our name for her….now we just had to FIND her! Needless to say the Travelcade was far more a project then we wanted. So the search of Craigslists from all over the USA, a tracking of http://www.RVtrader.com and even “looking for” postings on our personal FB pages finally paid off. We found our coach in the VT Craigslist on a Thursday morning, got out of work that day-drove 2.5 hours into the dark to see her. Used car headlights and flashlights to scope the exterior. Thankfully the owner could plug the power cord into his adjacent garage so an interior inspection was much easier. We loved her! She was in really nice shape save a few tweaks and had been consistently used which is far better than those left abandoned in fields and backyards. The owner accepted our offer and deposit and we drove back home another 2.5 hours that same night. This return home trip was filled with excited chatter and seemed to fly. To top it off, the owner even volunteered to deliver her to our door!